Unassuming Sophistication! Sweeping views of the Atlantic Ocean from second floor master bedroom deck. Situated only 300 yards from private beach stairs leading to one of the quietest beaches on the island. Indulge in a bit of serenity while relaxing in the quaint English style courtyard. 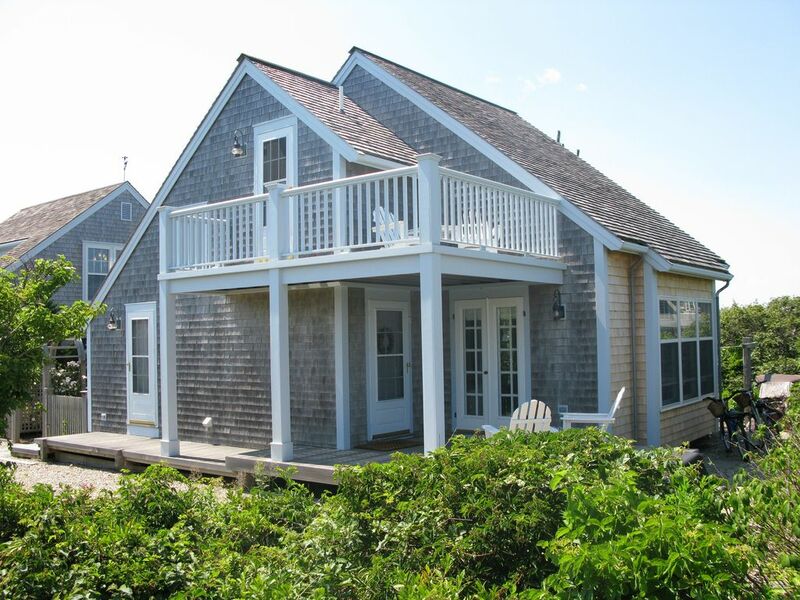 Enjoy the gentle, soothing sound of the ocean while you relax in this ''Quintessential'' Nantucket Beach Cottage. Short gentle walk to one of the most SECLUDED, CLEAN, PRIVATE salt water beaches on the island. This house is far enough from the crowds in Nantucket, yet closer to the supermarket and other services than most other outlying areas on the island. Bike paths will take you either to the picturesque village of Sconset or to the more than 80 miles of Nantucket beaches. The Tom Nevers area of the island features dense natural foliage, a surrounding ring of conservation land, expansive views and miles of secluded beaches. The higher elevation and gentle rises offer cooler breezes than the rest of the island. For a truly memorable experience, take your four-wheel drive out to secluded Great Point to fish and see the best sunrise on the island! Enjoy the numerous shops and restaurants, museums, library, art galleries as well as live theater and entertainment. You might even try a historic stroll or even a ghost walk at night! In town, at the wharves, you can sign up for fishing trips or join available bus, taxi or walking tours of the island. Deck/porch/patio, BBQ-grill, outdoor shower, washer & dryer, dishwasher, microwave, coffeemaker, linens included, cable TV, VCR or DVD, high speed Internet, no pets, no smoking. This is the perfect rental to experience all that Nantucket has to offer. Great Honeymoon location. After having visited the island for over 20 years as a renter, it became abundantly clear that Tom Nevers offered the best of Nantucket. This house is far enough from the crowds in Nantucket, yet closer to the supermarket and other services than most other outlying areas on the island. Bike paths will take you either to the picturesque village of Sconset or to the more than 80 miles of Nantucket beaches. The Tom Nevers area of the island features dense natural foliage, a surrounding ring of conservation land, expansive views and miles of secluded beaches. The higher elevation and gentle rises offer cooler breezes than the rest of the island, with no mosquito's! Views of the Atlantic Ocean. Amazing Ocean Views! Ocean View Deck off of 2nd Floor Master Bedroom. Spacious Deck off of living room. Excellent Family vacation property. We leave nothing to chance regarding comfort and convenience for our guests. Top quality appointments throughout. We provide Linens,bath towels, beach towels, beach chairs, outdoor gas grill, Keurig coffee maker, three Flat Screen TV's, board games and more. Location was next to none but the cottage itself was small & extremely hot. The mattress on the pull out couch non-existent, was like sleeping on a park bench, saying it sleeps 6 is a stretch though AC would have made the stay much more enjoyable. These are great accommodations. Quiet dead end road little to no traffic. The house is very well equipped for cooking and beach going. The house doesn’t have A/C but we actually needed blankets at night since the location near the water provided cool breezes. The house is so close to the beach you can hear the waves crashing as you go to sleep. You also will see the Sankaty lighthouse beacon softly flashing at night. The property was accurately described clean and very well maintained. The house was clean and updated, best part was being so close to a private beach. Frank was responsive and was quick to answer any questions we had. The only thing to note is that you are far from town (~20-25 min car ride). We were able to call ubers but if you don’t have a car it can get pretty pricey paying for cabs. Overall we had a great stay! This property has everything It advertises! The house is new and very clean. It's also very dry. It comes very well equipped with beach chairs, beach towels and two adult bikes. The kitchen is well stocked for all you need to cook inside and out. There is both a coffee maker and a Keurig. There is a nice bathroom and a good kids room with a trundle bed. Laundry is good. The outdoor shower is great and powerful. I never used the inside one. My kids say it was good. The upstairs bedroom is large and has plenty of room. The bed is very comfortable and comes with sheets and blanket. The only thing you need to know is the upstairs bedroom is the whole floor and has no door. The best part of the bedroom is the southern facing door that opens up to a great sitting porch with fantastic views. The owner, Frank is also very nice to work with. He was always available and very quick to respond to any of our inquiries. I think this is great spot, well stocked and worth your consideration. We had a great two weeks. One side note- there is a similar house on the property. It is owned by the owner and he said he doesn't rent it nor was he using it. This insured our privacy. I would be sure to ask if the 2nd property is in use or not. We have been coming to Nantucket for years and Tom Nevers is among our favorite parts of the island. It's quiet, while not being too far from the grocery store or town, and it has a beautiful and usually empty beach. Frank's cottage is peaceful, comfortable, and a short walk from the beach. Morning coffee or an evening cocktail on the balcony is just about as good as it gets. And Frank is probably the most responsive and hospitable property owner we have dealt with in all of our years coming to the island. Thanks very much, Frank. This is our second year staying at the cottage. And it was even nicer this time. The cottage is clean, comfortable and really feels like "home away from home." The ocean is only a minute's walk away and we were blessed by visits from several seal friends this time while walking on the sand on Tom Nevers Beach. If you have any apprehension about renting a place you haven't seen firsthand, let me assure you, this cottage is wonderful and worry free and Frank couldn't have been more accommodating to our needs. I truly appreciate your kind words and so happy you enjoyed your stay at the cottage. It was wonderful to have you and your husband back again this year sharing this little slice of heaven. Have a wonderful balance of the summer, we hope to see you again next year! Whale-watching, Seal watching, Deep Sea-fishing, Bird-Watching, Winery-Tours. This house is available for Winter Rentals. Rates subject to change without notice and until confirmed with a deposit.